‘Youyou‘ by Carlos de Mesquita published by R. Villeneuve (Paris, 1907) and illustrated by P. Sch. The illustration for the piano music Youyou is not the most captivating one. But its dedication “Au commandant du ‘Camille’ Madame Camille Du Gast” caught my attention. A youyou is a small boat or a dinghy used to tender passengers between a ship and the shore. 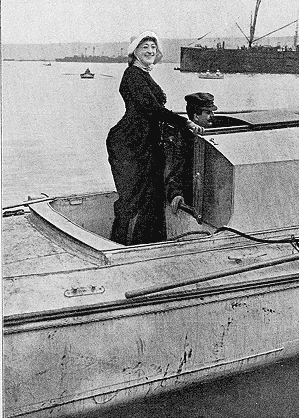 Here is a photograph of Mme Camille du Gast climbing from a youyou onto her motorboat, the Camille. Cover picture from ‘La Vie au grand air: revue illustrée de tous les sports’ published by Pierre Lafitte, Paris, May 1905. The adventurous Mme du Gast took part in the 1905 Algiers to Toulon race organised by the Paris newspaper Le Matin. Sadly, it would be the last time she boarded the Camille. Mme du Gast, wearing a southwester hat on board of the Camille. To ensure the safety of the seven competing motorboats, each one was accompanied by a torpedo boat destroyer. Moreover, two cruisers followed the race. Sixteen hours after leaving Algiers the Camille arrived in second place at Port Mahon, a harbour on the Spanish island Minorca. 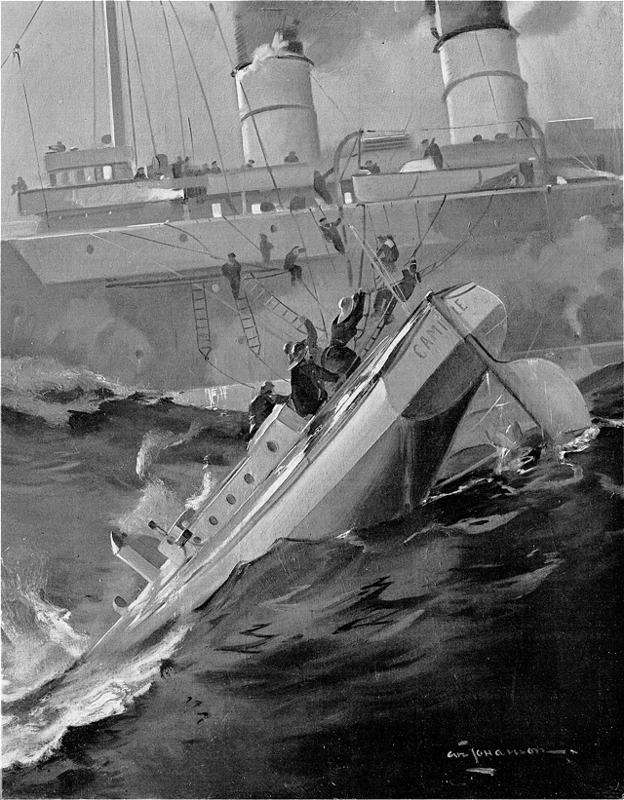 An artist’s impression of the crew of the Camille being saved by the Kléber. 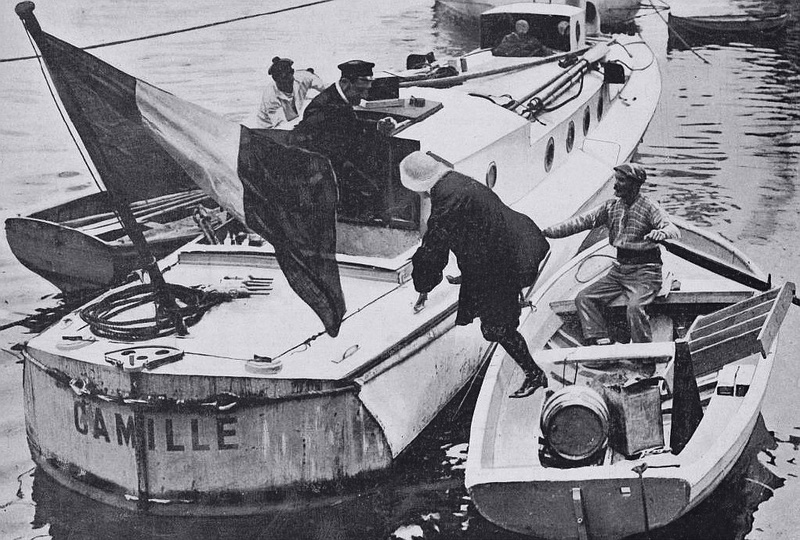 In the second part of the race the participants tried to reach Toulon, but this ended in disaster. All competitors and their crew had to be saved from the fury of a storm-swept Mediterranean. The Camille was engulfed by the violent sea. 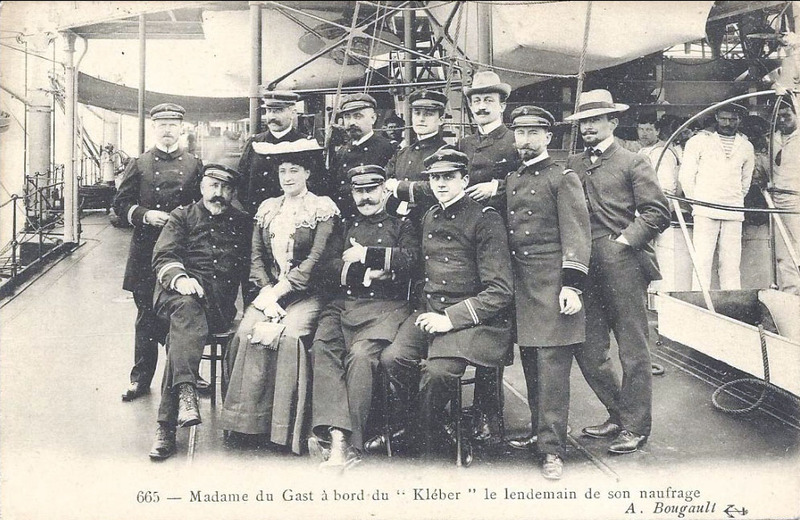 In a perilous operation led by the cruiser Kléber, the crew of the Camille was pulled aboard. But not before an exhausted Mme du Gast fell into the sea and was heroically rescued by a sailor. The Camille was left to the mercy of the waves. Two months later, Mme du Gast was declared the winner of the Algiers to Toulon race having come closest to finishing before sinking. The 1905 Algier-Toulon race was not Mme du Gast’s first valiant exploit: she loved fencing, tobogganing, skiing, rifle and pistol shooting, ballooning, parachuting and horse training. 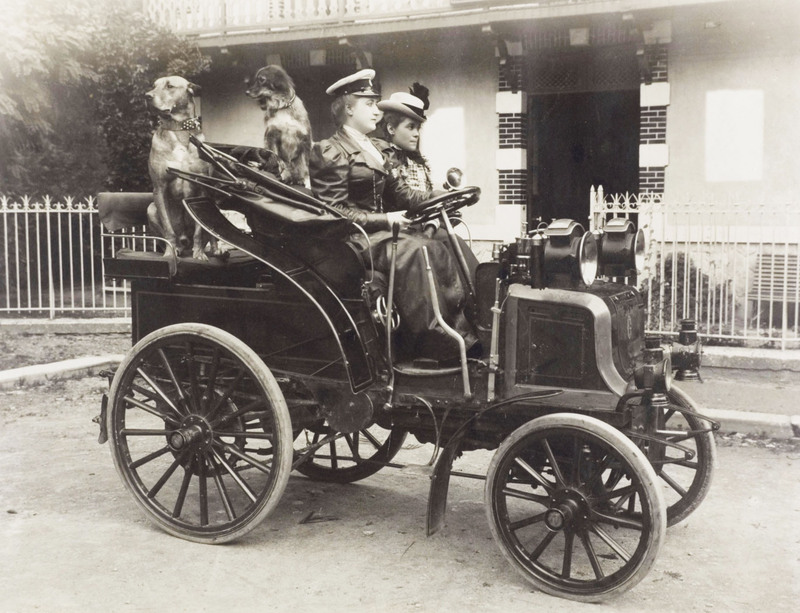 She rode her first automobile around 1900 and participated in glamorous capital-to-capital car races, such as Paris-Berlin in 1901, Paris-Vienne in 1902 and Paris-Madrid in 1903. Mme du Gast’s sobriquet, the Valkyrie of motorsports, elegantly expressed her buxom figure, as seen on these photographs. Camille du Gast posing in her leather duster and matching chauffeuse’s driver hat. 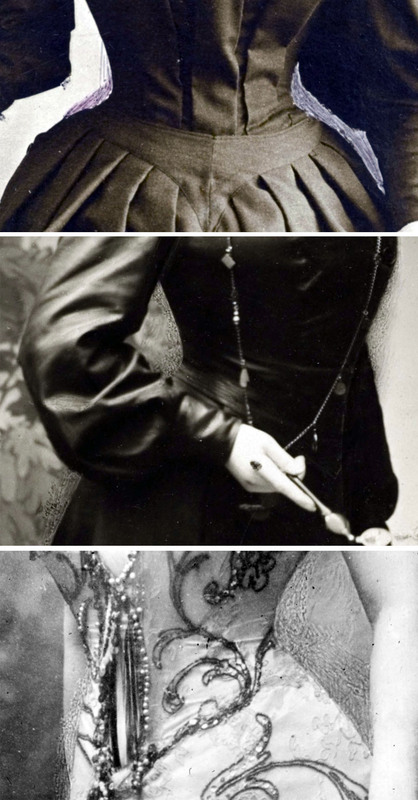 It is said that she had a very upright position when driving her motorised vehicles because of her corset. Looking at the picture with her at the rudder of her ‘canot‘, I find her silhouette mesmerizingly disturbing. 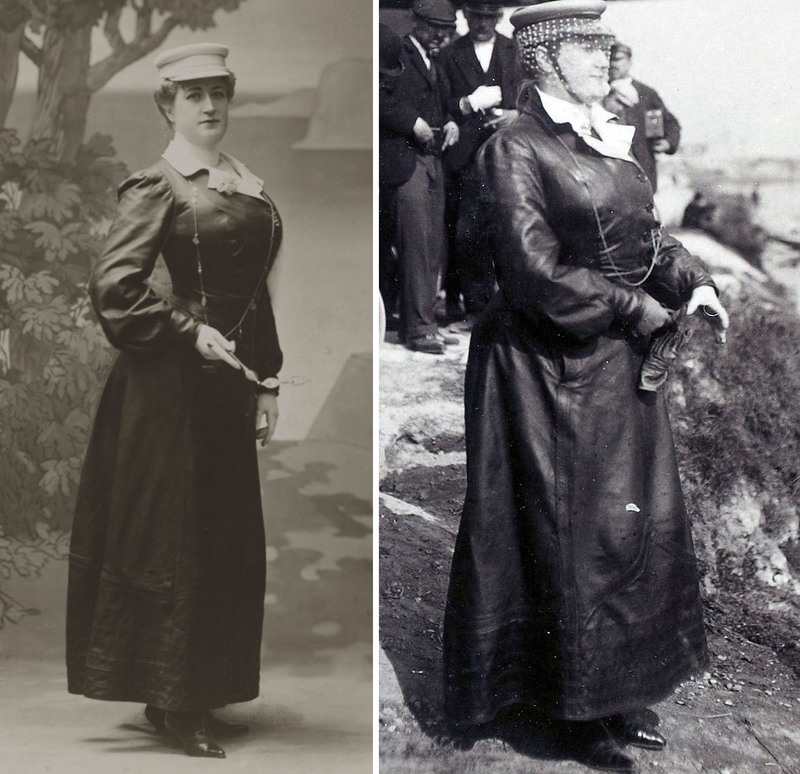 I then imagine that she just donned a corset for official pictures, and immediately tucked the hindering girdle into a corner when going for action. Disappointingly, it seems that du Gast’s perfect hourglass shape is but the result of photographic retouching. Look at the telltale pencil corrections around her waist, belly and hips on these magnifications. 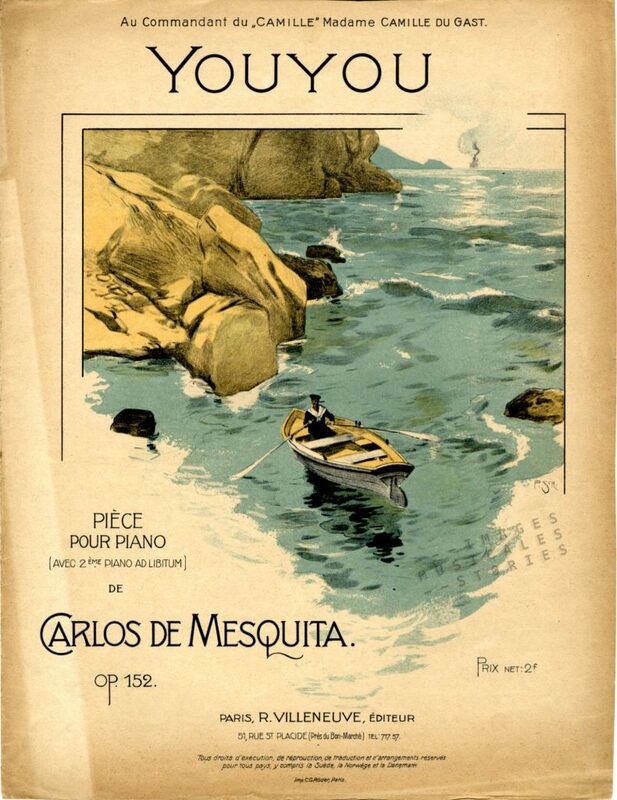 The composer of Youyou was Carlos de Mesquita, a Brazilian-born concert pianist and composer. In 1877, aged 13, he left Brazil to study piano and organ at the Conservatoire de Paris where he took lessons with Jules Massenet and César Franck. In the 1880s and 1890s he would introduce their work in Brazil, together with those of Delibes, Bizet, Gustave Charpentier and Saint-Saëns. Through his Concertos Populares, de Mesquita not only introduced a new repertoire in Brazil. He also tried to musically educate and appeal to a growing middle class. His noble intention was undoubtedly inspired by his colleague Gustave Charpentier, who founded in 1902 the Conservatoire Populaire Mimi Pinson for the musical schooling of working girls. We found another Carlos de Mesquita’s sheet music in our Images Musicales collection. It is also dedicated to Camille du Gast and portrays her profile in a tangled Art nouveau floral design. A sign of respect, or was there also un peu d’amour..? 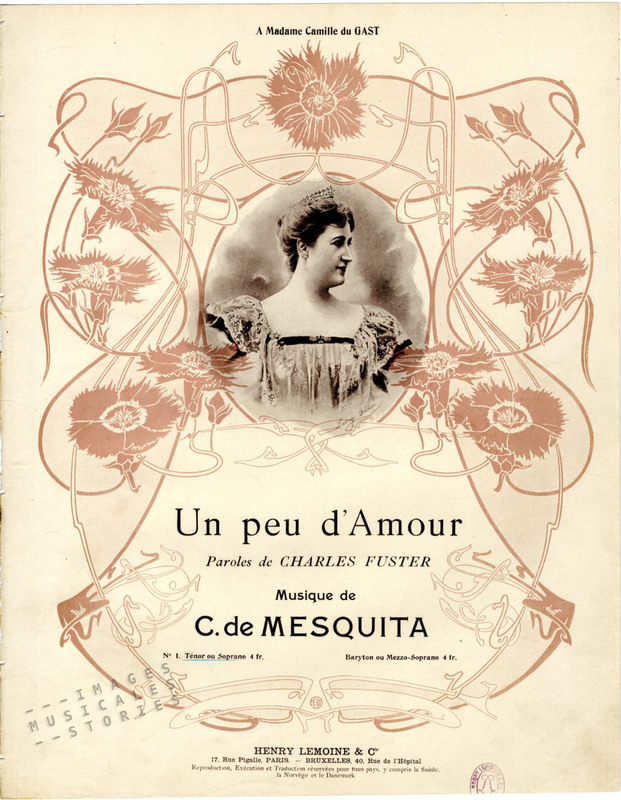 ‘Un Peu d’Amour’ by Carlos de Mesquita and Charles Fuster, published by Henry Lemoine & Cie (Paris, sd) and illustrated by ED. Camille du Gast – publicity picture for a piano recital, presumed c. 1890s (source: Library of Congress, Prints & Photographs Division, Bain Collection). 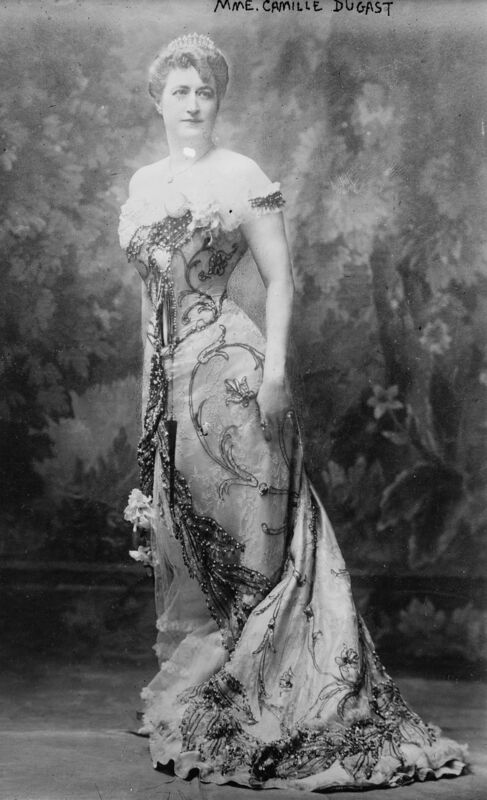 The mondaine Camille du Gast got entangled in a scandal following the trial against her brother and father whom she had accused of embezzlement. Maître Barboux acting for her relatives, hit below the belt when he showed the court a picture of a painting of a naked lady. Barboux claimed that the lady, only clad in a mask, was Mme du Gast (as he had been told by Mme du Gast’s father and brother). Oh my god! ‘La Femme au Masque’ by Henri Gervex, 1885. 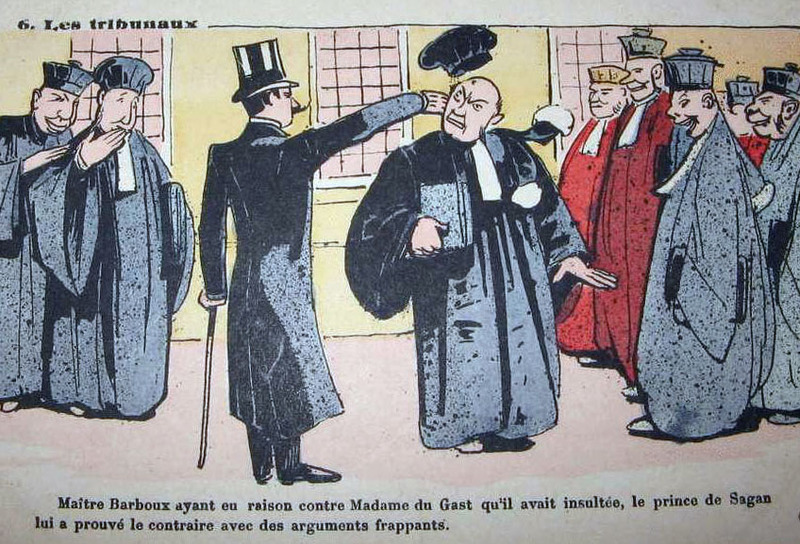 Mme du Gast’s libel action against Maître Barboux caused a sensation in Paris. Both the artist Henri Gervex and the girl who had stood model for the painting, Marie Renard, corroborated du Gast’s case. Still they were not given a hearing. Maître Barboux refused to apologise and moreover won the case on a legal technicality. 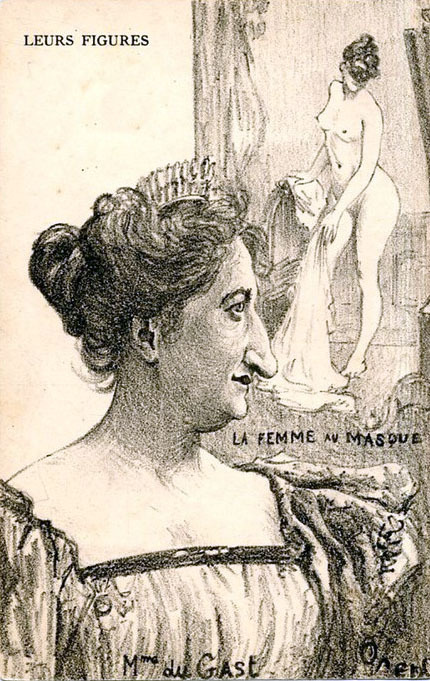 Post Card, mocking Mme du Gast and her supposed modelling for ‘La femme au masque’. It is said that Madame du Gast who was present in the courtroom, had hidden a horsewhip in her parasol with the intention of administering correction to Maître Barboux. However, he prudently chose to leave the Palais de Justice by a private way, as he knew that Madame du Gast and her friends were in a very excited state after the decision of the Court. But that is not the end of the story, as the prince de Sagan, a friend and admirer of Mme du Gast, followed the lawyer to his house with the firm determination to avenge the honour of Mme du Gast. He slapped Maître Barboux in the face calling him an insulter of women. An hour later, following impeccable manners, the prince sent his card to Barboux’s house. The Australian West Gippsland Gazette (september 1902) further reports: “Maître Barboux, as already noted, is no longer a young man, although very active, and he has, in any case, passed the fighting age, so he prefers the legal way of obtaining satisfaction.“ Another lawsuit followed. Although the court accepted that the prince had acted in good fate, he was condemned to pay a 500 francs fine. 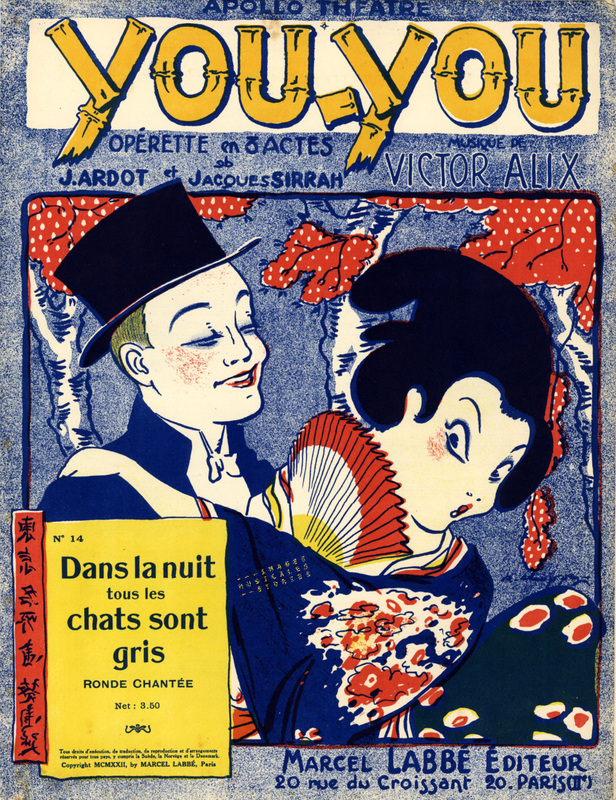 ‘Dans la Nuit tous le Chats sont Gris’ from the You-You opérette of Victor Alix, J. Ardot & J. Sirrah (Marcel Labé, Paris, 1922). Illustration by Choppy. 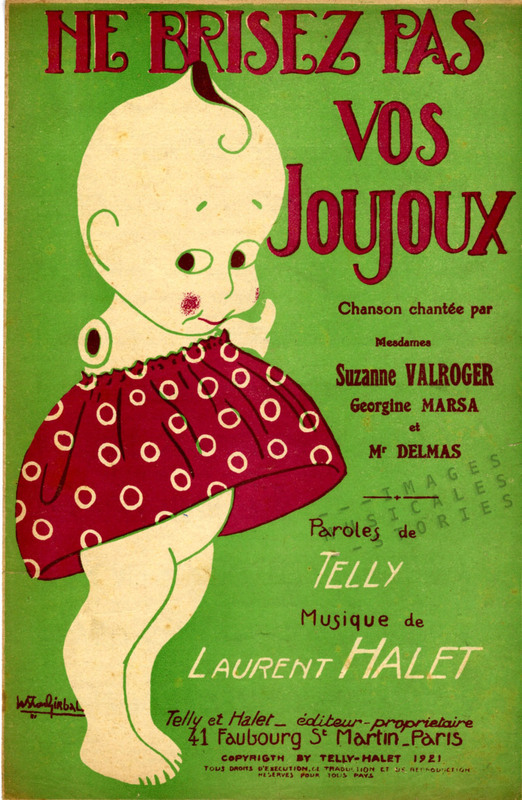 ‘Ne brisez pas vos joujoux’ by Laurent Hallet & Telly, published by Telly et Halet (Paris, 1921) and illustrated by Gaston Girbal. ‘Do not break your toys!’ cries the cute one-armed doll. A warning to children. Or is it a moral advice to adults, as in the 1944 Mills Brothers’ hit ‘You Always Hurt the One You Love’ ? 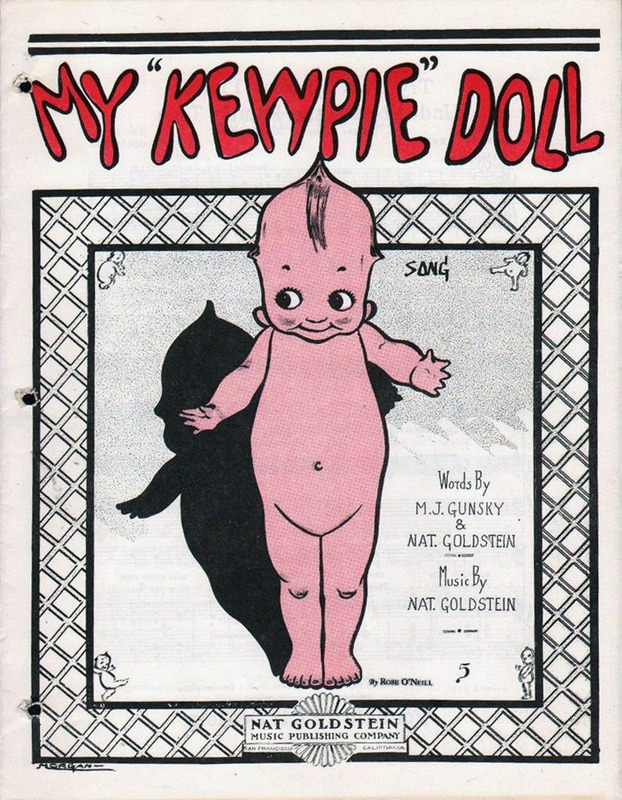 In fact I have been chasing this particular cover in our dolls collection of sheet music. 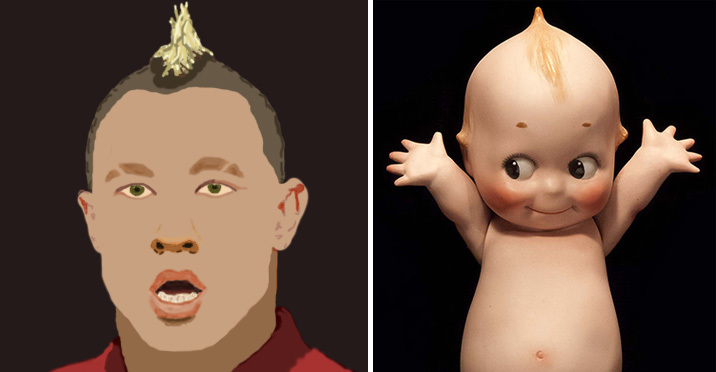 I was intrigued, and wanted to know if the doll’s peculiar hairstyle would match that of Radja Nainggolan. He is a Belgian football international currently playing for AS Roma. Let me set his portrait side by side to a photograph of such a doll. Left: portrait of Radja Nainggolan. 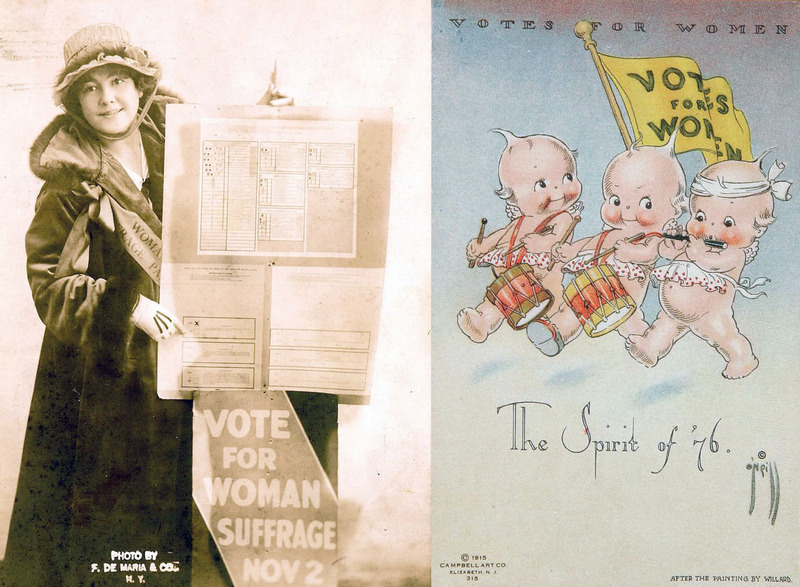 Right: a kewpie doll (© picture: The Mel Birnkrant Collection). These dolls typically have big eyes, a tuft of blonde hair, a pot belly and splayed hands. 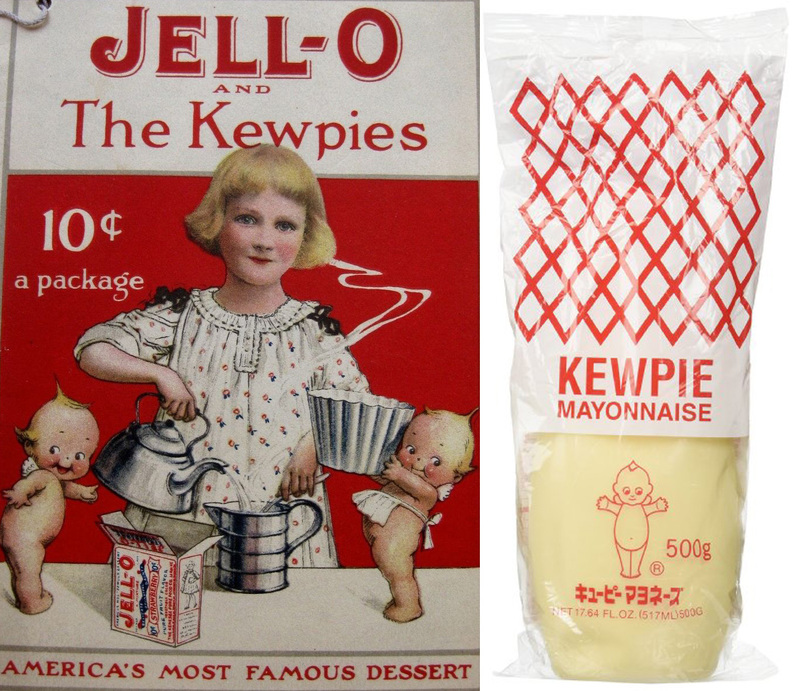 They are called Kewpies and are inspired on the 1909 creations of writer and illustrator Rose O’Neill. She brought into being the little comic characters for her cartoons. The tiny creatures were always helping people out of trouble, battling injustice and making the readers laugh. 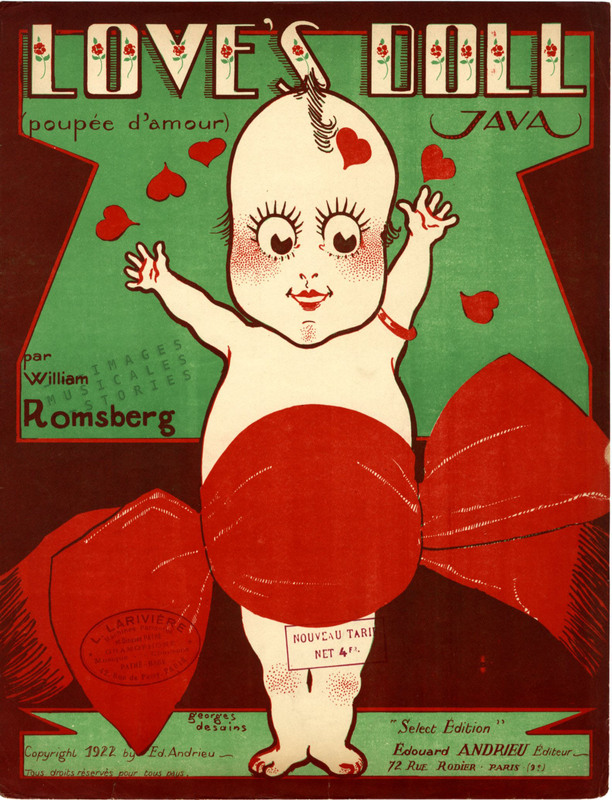 ‘Love’s Doll’ by William Romsberg, published by Edouard Andrieu (Paris, 1922) and illustrated by Georges Desains. The dolls were uber cute and resembled cupids, hence their phonetic name ‘Kewpie’. A few years later a German company manufactured them in porcelain, which made them very fragile as toys. Dressed in a wide satin ribbon with a large bow in the back, the dolls became very successful in America. Soon the popularity of the Kewpie Doll also spread over Europe. From the mid 1920’s on they were mass produced in celluloid and chalk. The small playthings were often given as a cheap present at fairs. This use continued even until 1958, as can be seen in the ‘Kewpie Doll’ song by the American crooning baritone, Perry Como. The dolls also featured in advertising and were in 1925 the inspiration for a –still existing– brand of Japanese mayonnaise. Rose O’Neill made a fortune from these first mass-produced dolls. She nearly sacrificed all of it in order to help out her family and friends. She was also an activist for women’s suffrage. To end our little post, and since you have been humming that tune from the beginning, here they are: The Mills Brothers ! ‘Ah! Suzanne!’ by Christiné, Willemetz & Saint-Granier published by Salabert, Paris in 1926 and illustrated by Roger de Valerio. 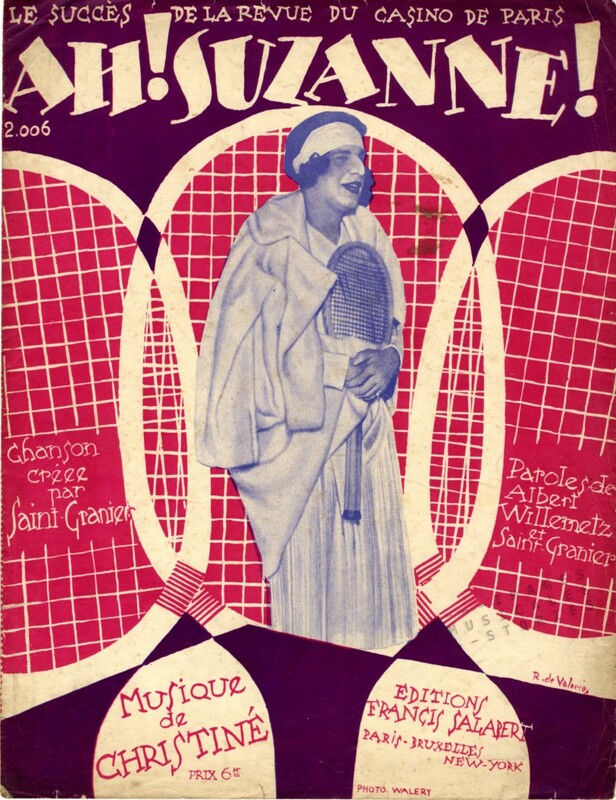 To avoid all confusion: it is not a picture of Suzanne Lenglen on this sheet music cover, but of the French singer Saint-Granier. In 1926 he made a ‘hilarious’ performance imitating Suzanne Lenglen in the Casino de Paris. We don’t know if it was extremely amusing, but his burlesque imitation at least looks kind of funny. Saint-Granier (Jean de Granier de Cassagnac) was a nobleman from Gascogne who made a career as a journalist, writer, lyricist, singer and actor in Paris. 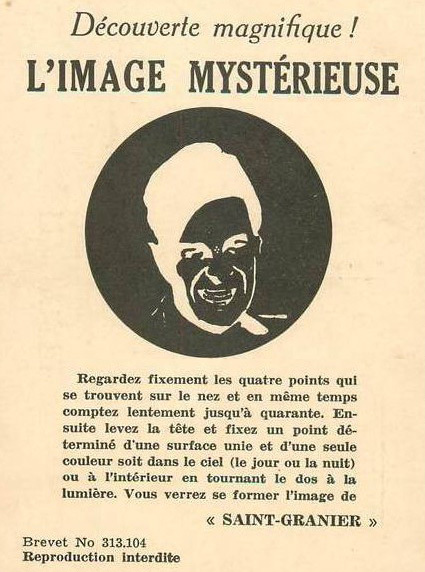 For a hallucinating experience concentrate on the four dots on Saint-Granier’s nose, count to 40 and then stare at an even area. Slowly, mysteriously and straight from the Roaring Twenties, Saint-Granier will appear before your very eyes! This beats getting drunk. The charismatic Suzanne Lenglen was named La Divine or the goddess by the French press and was one of the first celebrity athletes. 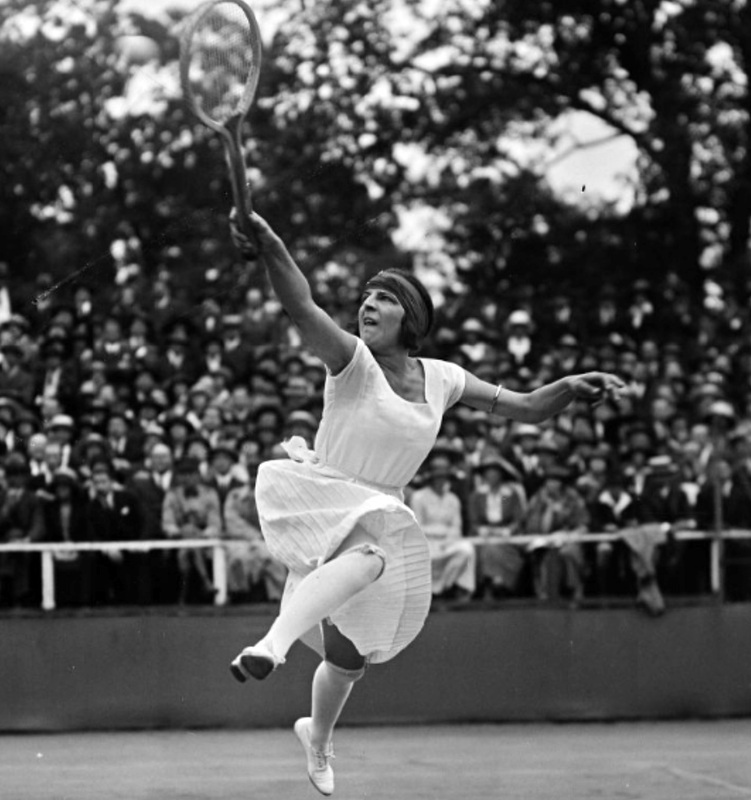 She revolutionised and dominated women’s tennis from the end of the First World War until 1926. She was coached by her Papa and trained by male players on the Côte d’Azur. She played a man’s game, in an aggressive serve-and-volley style and serving overhead. Sometimes, during a tough game, a sip of brandy and a curse would propel Suzanne to victory. It helped her win six Wimbledon singles titles. Moreover during her career she only lost one match. Evolution of tennis outfits. 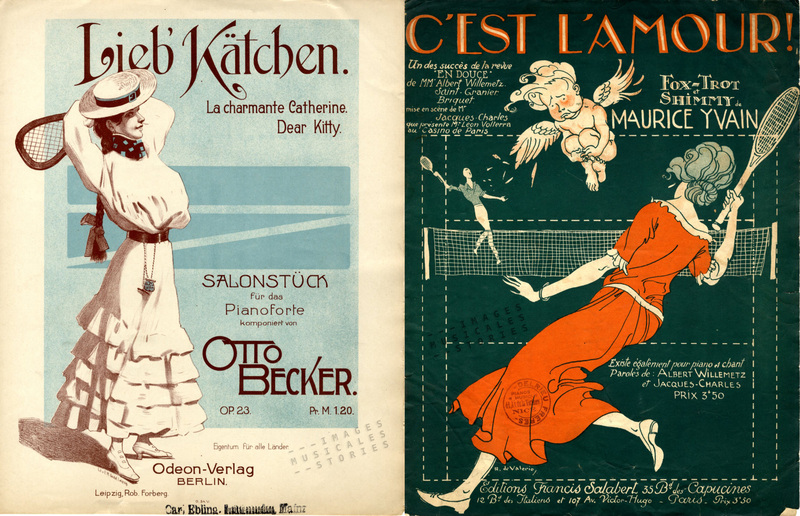 Left: ‘Lieb’ Kätchen’ by Otto Becker, published by Odeon, Berlin. Right: ‘C’est l’amour’ by Maurice Yvain, published by Salabert, Paris in 1922 and illustrated by Roger de Valerio. She was also a flamboyant and graceful player and in spite of her homely face she became a fashion muse. 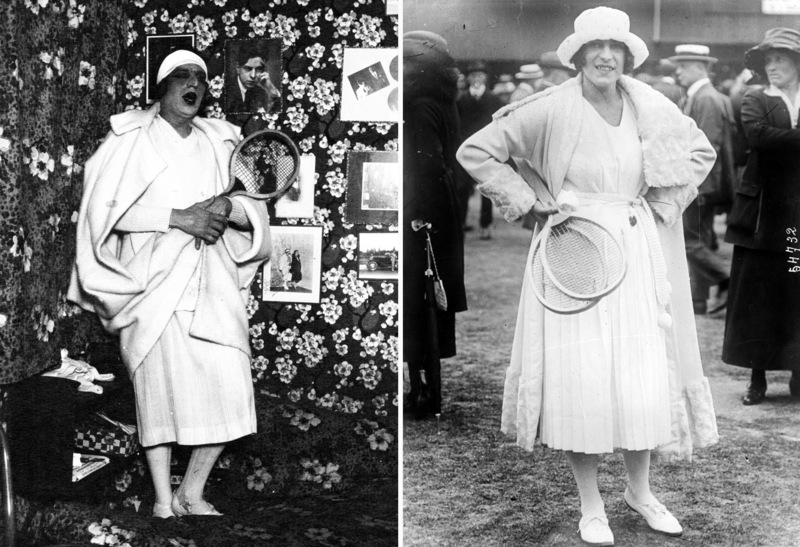 Suzanne Lenglen brought the glamour of the French Riviera to Wimbledon. In 1919 during her first appearance there she made it clear that the jazz age was on its way. Her opponent in the final, the seven-time Wimbledon champion and the title-holder, was dressed in an ankle-lenght skirt, with the shirt fastened at the wrists and neck and a corset underneath. Suzanne Lenglen won (albeit not without a struggle) in a short-sleeved frock reaching to the calves and her hair bobbed. Suzanne Lenglen, French championships 1922 (source: Bibliothèque Nationale de France). She would kick her legs high up in the air, not minding at all that one could see her pants or get a glimpse of a bare thigh. Instantly she became the goddess of tennis and an example for all flappers. Her dress code would be copied worldwide on and off the court. She usually made her entrance in a fur or fur-trimmed coat which she even showed off during breaks, regardless of the heat. Underneath she wore flimsy Art-Deco ensembles created by Jean Patou, stockings rolled to the knee held by a cerise garter, and a brightly coloured silk chiffon bandeau on her head. 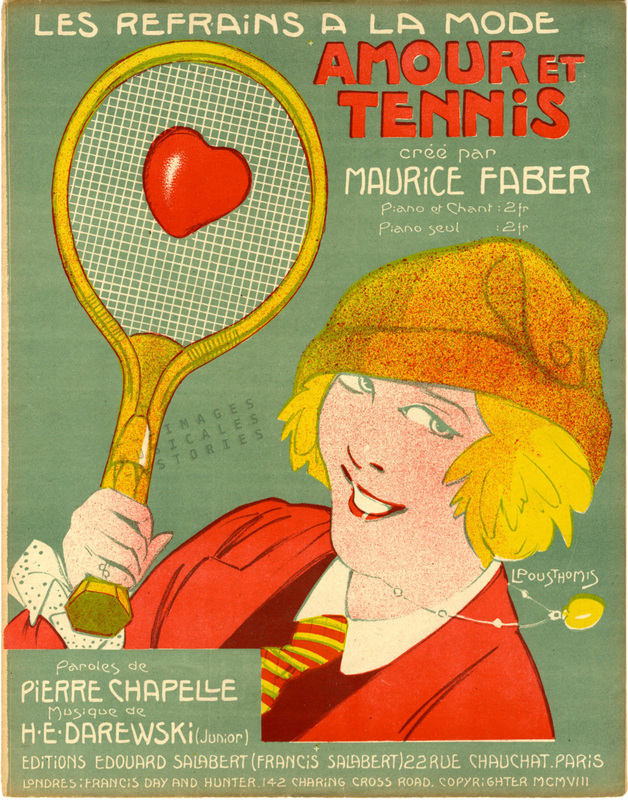 An excerpt from British Pathé’s ‘How I Play Tennis – By Mlle. Suzanne Lenglen (1925)‘, a 16-minute silent documentary. 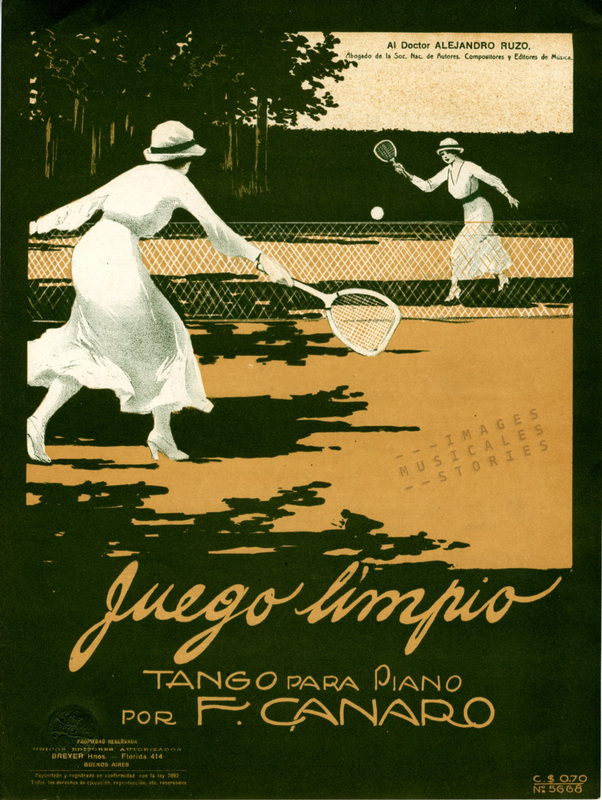 ‘Juego limpio’ by Francisco Canaro, published by Breyer Hermanos, Buenos Aires, s.d. Apart from gossipy proposals from dukes, counts, earls and American millionaires, and contrary to tabloid reports of pending engagements with wealthy gentlemen, Suzanne never got married nor engaged. So she wasn’t lucky in love, nor in her later life: she died suddenly when she was only 39 years old. ‘Amour et Tennis’ by Darewski and Chapelle, published by Edouard Salabert, Paris, 1908, illustrated by Pousthomis. Suzanne Lenglen was an enthusiastic dancer. She even claimed the fox-trot, the tango and her favourite, the shimmy, were excellent training for tennis. It was maybe this love for dancing together with her graceful acrobatics on the court that inspired Diaghilev and his Ballets Russes. His production Le Train Bleu by Jean Cocteau (scenario) and Darius Milhaud (music) staged a tennis player based on the elegant Mademoiselle Lenglen. Re-staging of Le Train Bleu by the Paris Opera in 1992. Music by Darius Milhaud. Costumes by Coco Chanel.